Flying with kids does not have to be a scary concept! I think that most parents dread that first flight, because in our minds we expect it to be so much worse than what it will actually be! On our flights with our kids, we have been lucky to have mostly smooth-flying experiences! My most challenging flight was an overnight flight where my daughter was tossing and turning and kicking me all night long! We love our family travel adventures so much, that to us, the small challenges that come from actually getting to our destination is all worth it in the long run! 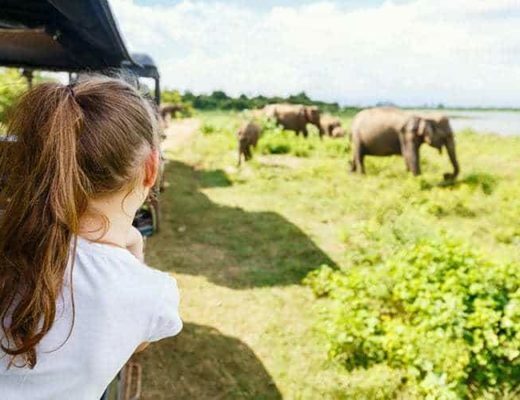 Travelling with kids can be one of the most rewarding experiences for a family! Not only is it a fabulously fun educational way for the kids to learn about other parts of the world, but it opens up a whole avenue of opportunities to create some truly quality family memories as well. The more you fly, the easier it becomes and the more likely it is that your holidays with kids will become second nature! 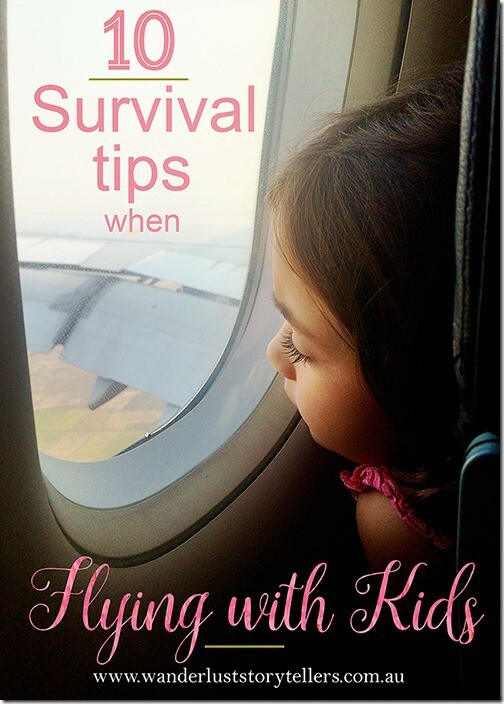 So please find below our ‘’Top 10 Essential Survival Tips for Flying with Kids’’. We are sure you will find something beneficial in the list! Try to book flights outside of school holidays (over low season) if you can. Having extra seats for the kids to stretch out or to sleep on can be a lifesaver! Try to book direct flights if possible! Book flights that leave and arrive at times that work for your child and the sleeping routine. You know your child best! If they are good sleepers, you might want to look into booking an overnight flight! Especially if they are at the busy toddler stage, this will help you keep your sanity instead of having a restless little one hopping up and down on your lap. 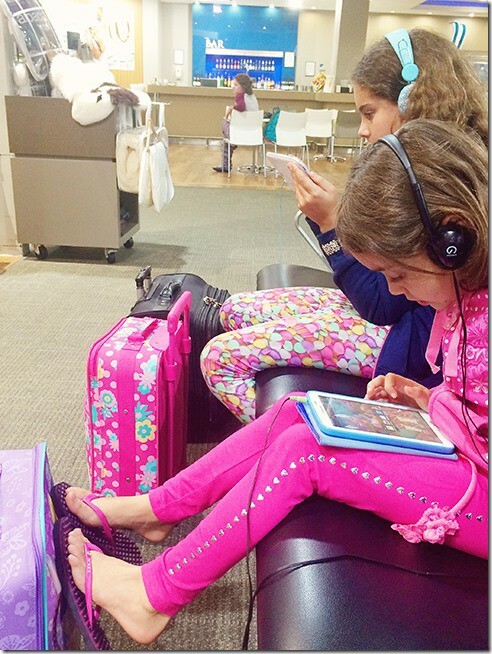 My kids are not the greatest sleepers and at an older age now (6 and 10), I would rather pay extra for a day flight as they can keep themselves entertained for hours on end with electronics! Whilst overnight flights leave them tossing and turning and results in me getting no sleep at all! Think about the best way for your family to sit. We are currently a family of 4 and that means that on smaller airlines, we either have to split up in a 2:2 arrangement or a 3:1 with an aisle in-between. I have tested out both and can vouch for having the 3:1 combination on overnight flights. It is super tricky having a stranger sitting next to you when your child is trying to sleep over you. On shorter flights, we often split up in a 2:2 arrangement so that each child will be next to the window (saves us the argument of who sits where). Most airlines let parents with young kids board first! Very nice of them, but our advice is to board last! As soon as you have boarded, the kids will need to sit down and sometimes boarding takes a while! Best to let the kids run wild while everyone is getting settled and then hop on at the last moment, so you can get them settled without a queue of people getting annoyed as they can’t get past you! Which kid doesn’t love to stare out at the sky and fluffy clouds? Allowing them to sit by the window has multiple benefits. It will occupy them as they watch their journey through the window. It means they can’t annoy anyone sitting next to them by their constant fiddling. It also means that they can curl up and press their feet against the wall. I discovered my 6-year-old is a ‘kicker’ when restlessly sleeping. Image having to try and control those feet if they are pointing at someone else? No thanks! Older kids can also use the wall of the airplane to rest their pillows on. The best way to do this is to purchase luggage that fits underneath the child’s chair. Otherwise, make sure to bring out the entertainment goodies, the snacks and something warm for in case they get cold. Make sure you choose practical kids suitcases. We love to purchase children's rolling luggage that we know will fit in the overhead compartments on planes. On short haul flights, we love to just keep the kids' bags with us as carry-on bags. It is handy as it contains extra clothes, toys and special items that the child might want. However, when we know we have lots of stopovers on a long haul flight to a faraway destination, we prefer to book the bags into the luggage hold so that it can get booked straight through to the final destination. That way we aren’t asking a tired child to drag along a suitcase, and leaves our arms free to carry the child if they are sleepy. In that case, we tend to just use a backpack for the kids carry on luggage instead. Easy to chuck it on our backs if need be. See our suggestions for great children's suitcases with wheels, or grab some carry on kids luggage from our helpful guide here. For budget type flights, we also pack our own kids-sized blanket. Electronics for Entertainment: Electronics! Kids are easy to entertain if you hand them some sort of electronic entertainment. 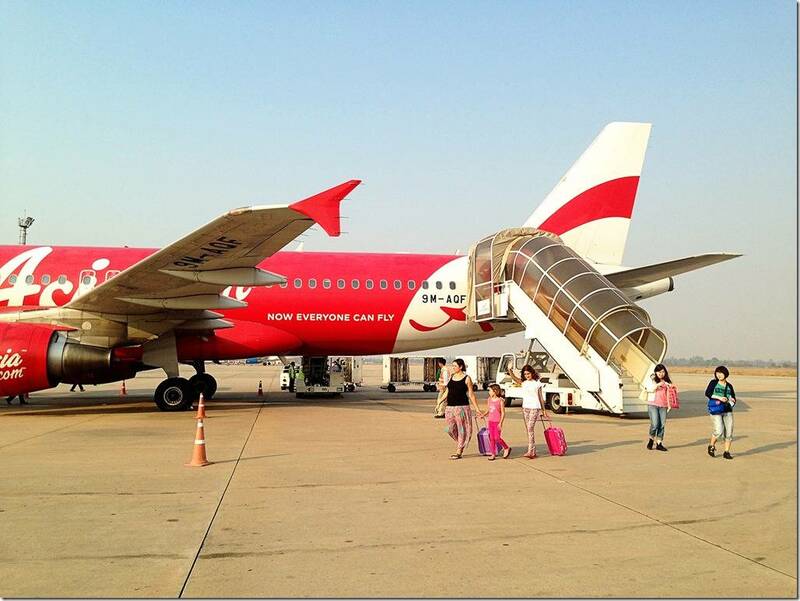 We tend to fly on budget-style airlines when we fly as a family as it is just so much more affordable. So last Christmas, the girls each got their own Samsung Tablets. 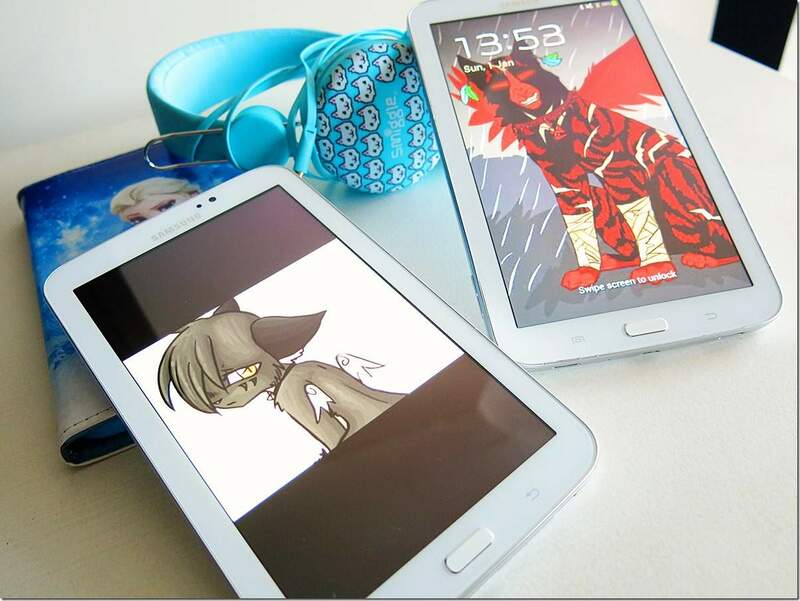 Tablets are heaps cheaper than iPads, so perfect for kids who might drop them or scratch them! You can check out prices and find more details on these Tablets here. Travel Games: You might also like to pack in some Travel Games for Kids. These games are small enough to pack in your carry-on luggage and will keep the whole family entertained! Long-haul flights can be really trying and tiring for both parents and kids. Think about the best way to break up your flights. 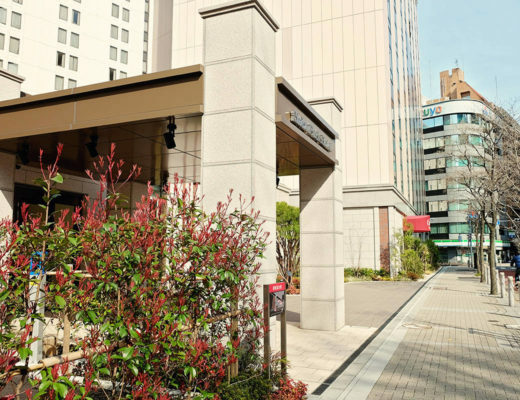 For us, that means that sometimes we stop over in halfway destinations for a night of good sleep in a hotel close to the airport. Worth a few extra hundred dollars I say! Think about your layovers as well. If you have younger kids, it might be tricky to get to your departure gate when at larger airports and limited on time. On the other hand, if you will be spending a lot of time at the airport waiting around, think about ways you will be keeping your child busy. For the flights themselves, it will be important to either get the kids comfy and cozy to sleep or to keep them occupied with entertainment goodies. It is also important to take snacks! If the kids do sleep they might wake up hungry, best to having something on hand! Another tip we have is that if the plane is fairly empty, don’t be afraid to politely ask a person or two if they mind relocating to another seat so there is more space for your kids to stretch out and get some good sleep. Check out this awesome infographic on why sleep is so important. And lastly, remember: This flight will end! On long-haul flights, we prefer to book in the kids' luggage into the baggage hold. This allows for any stop-over destinations to run more smoothly. It leaves us free to carry the kids if they are too tired to walk from the arrival gate to the departure gate. When we choose to book-in our bags, we will usually use one adult sized suitcase for both girls. Not only is this cheaper when you fly on airlines that charge you for each bag you book in, but it also means that you will have less to drag around with you! When you choose to have only one suitcase for your children to share, there is a great tip that we would like to share with you to make life easier! And this is ‘PACKING CUBES’!! Packing cubes will make life SO MUCH EASIER once you get to your destination! You can pull out the cube and pop it on their bed and that way there is no fighting or tumbling clothes upside down in the suitcases as both try to rummage through it to get hold of their clothes. Purchase two sets of cubes in different colours and allocate a colour per child! Keeps everything nice and tidy!! Love them! eBags Packing Cubes are one of the more popular brands of packing cubes out at the moment. You can check out colours and more detail about them here. Our last tip for your travels is to pack oodles and loads of ‘patience’. You know that this might be tricky for your child, you know that it is a big ask asking any child to sit still for that long. You know your child will get tired walking through the airport, and having to queue up in lots of different queues before finally settling into their seat. So make sure you get plenty of rest the night before the trip and make sure that your patience levels are switched on to full-throttle. You can do this! You know this flight will end and all will be good enough! 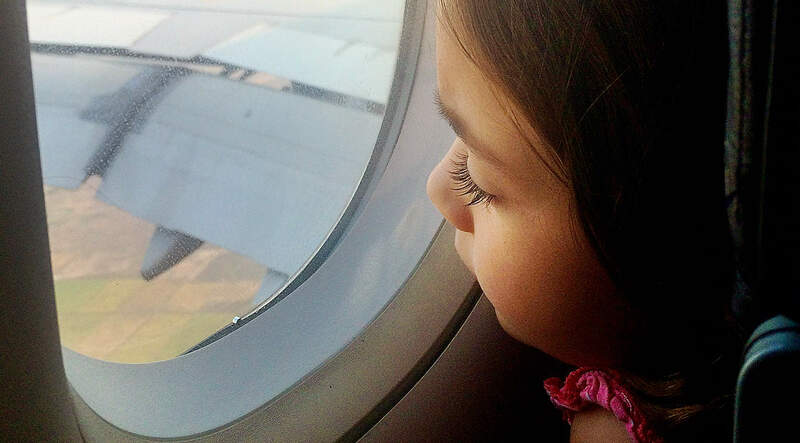 Hopefully, you will all find something beneficial for your flights with kids in our list. Do look out for a special feature on flying with babies, once our little one is born. You can do this! 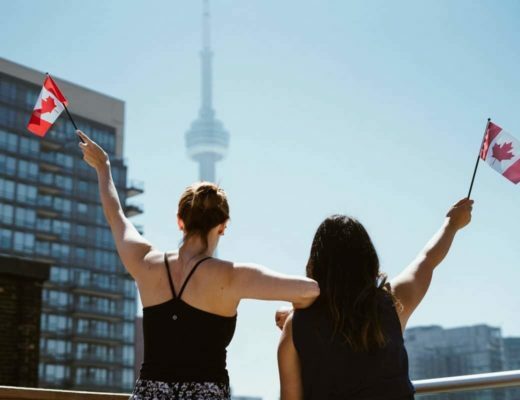 Book those flights and have confidence that you have it all under control! 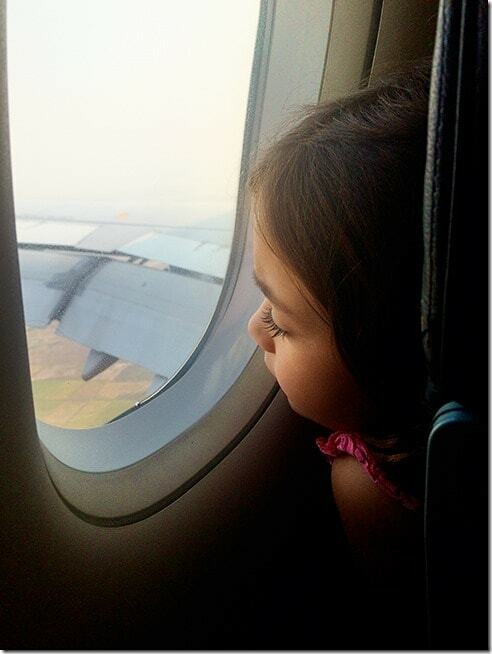 Did you find any of our tips for flying with kids useful?